The Squirrel candy company might be famous for their Nut Zippers, but if it wasn’t for their original chocolate caramel, the Nut Zipper might have never seen the light of day! They invented the Zipper to compliment their original chocolate caramel, which grew to be a favorite in its own right. Squirrel’s chocolate caramels had a taffy-like texture with swirls of rich caramel and those golden peanuts that the Squirrel company was famous for. They’ve unfortunately been discontinued, but if you miss the taste of that chewy chocolate caramel, there are still some options for you. 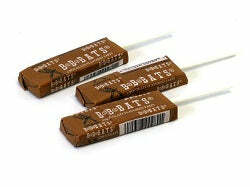 Try a delicious chocolate BB Bat! The presentation is a little different, as these taffies are marketed like a pop, but the flavor and texture are a good match for Squirrel’s chocolate caramels. It’s the taste of chocolate with that caramel chew, and although these don’t have the same crunchy nuts, they serve as a worthy substitute. The nuts in Squirrels chocolate caramels are really what set it apart from the rest, and it has proven especially difficult to find any chocolate caramel or taffy that contains those crunchy little legumes! The original has been lost to time, but you can keep the hope alive with these delicious taffy pops. These BB Bats will satisfy the taste quota, but please write us in the comments if you’ve found a better alternative!